If you visit Almeria by car, you may need to know how to move around and what roads to take. 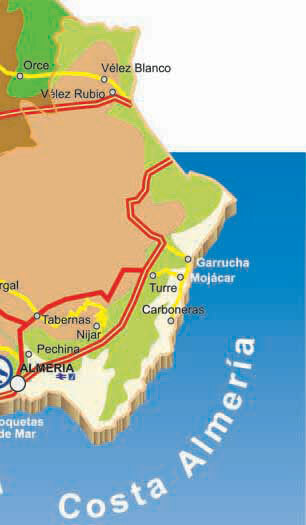 We hope our Almeria road map will be useful during your vacation. 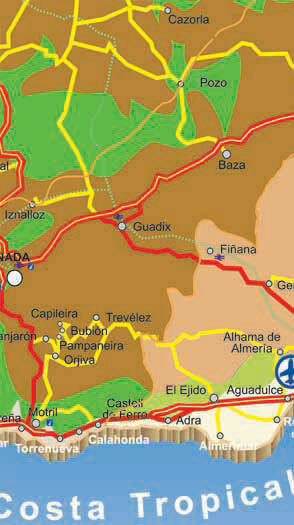 A-334 The regional road connects Baza in Granada with Huercal-Overa in Almeria. A-347 This road connects Adra, Berja y Alcolea; it is one of the main routes in the area of Almeria´s Alpujarra connecting with the Mediterranean Motorway. A-348 This road passes through a large number of villages in its passage through the region of the Alpujarra and connects Lanjaron and Almeria through Ugicar. A-349 Connecting with the national road N-340 near Tabernas, it is an important road linking the Almanzora Valley with Almeria city across the Sierra de Filabres. A-391 Popular road during the summer season joining the A-7 (Mediterranean Motorway) nearby Roquetas de Mar and Aguadulce and communicating with the region of Las Alpujarras towards Sierra de Gador and linking along the way with the A-348. Motorway A-92 Highway that connects Seville with Almeria through Estepa, Antequera, Granada and Guadix. On this highway you can travel at 120km/h unless otherwise specified.